On my recent trip to Louisville I brought home what I thought was a decent haul of bourbon. In fact, my wife believed that the six bottles could last me three months (hahaha, silly wife!). Here I am, though, just over a month removed from that trip, and I'm finding the bottom of the last couple bottles from that trip. While it has saved me a number of trips to the liquor store, it nonetheless makes me sad to realize that I'm to the last drops of my mementos from my pilgrimage. 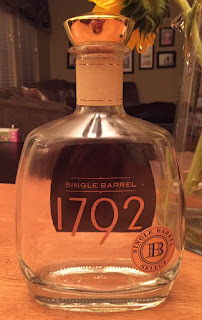 This Barton 1792 Single Barrel, a private selection from their gift shop, however, was the one bottle that I tried to make last. I first cracked into this bottle on the bus back to Louisville after hitting Barton as our last distillery tour of the day. I opened the bottle and was hit immediately with a heavy vanilla nose. Even my tour guide noticed the nose from across the aisle of the bus. That vanilla nose very much carried through to the palate. In fact, this is the closest thing to a vanilla bomb bourbon that I've had in a while. I thoroughly enjoyed it after a long day of distillery tours and bourbon tasting, and I continued to enjoy it each pour thereafter. In addition to the heavy amounts of vanilla, it had a buttery walnut undertone, making it almost pastry-like in flavor. However, at the back end it was complemented by an unexpected smokiness. To add to the complexity of this bourbon, as I made my way through this bottle I began to notice a very tasty amaretto flavor that would hang around the back of my throat long after each swallow. This bourbon really coated the mouth and, in general, seemed to stick around forever. Whoever picked out this barrel has incredible taste. Although this cost a bit more than the bottles you find on the liquor store shelves, it wasn't that much more, and was still worth every penny. I was sad to see this one go, not only for the sentimental reasons noted above, but also because I knew I wouldn't be able to find this one again.